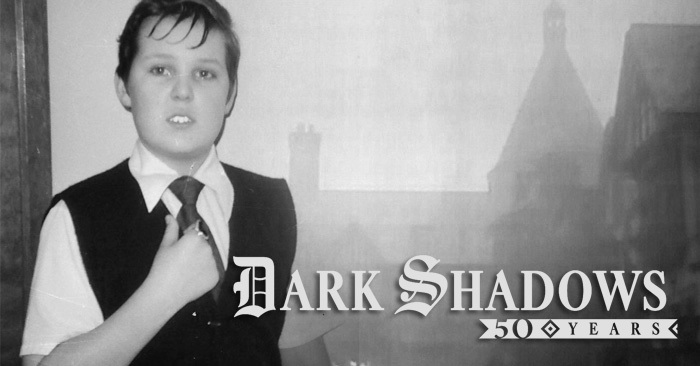 Dark Shadows – A Nifty, Fifty Years! Unlike a lot of the kids in my quaint South Dakota neighborhood, I wasn’t content to simply play wiffle ball in the backyard on sunny afternoons. I eschewed such useless frivolity for much more important recreational endeavors; those of which would ultimately play into my future career as an actor. A friend of mine bought the “Barnabas Collins” board game and I couldn’t stop looking at the cool box art. I had been a fan of the show for quite some time, but without any access to local stores that sold stills from the show, this image alone served to captivate my imagination. Looking at the painting of Barnabas baring his fangs and displaying his ultra-cool ring and wolf’s head cane sent my young mind spinning. I was elated when he traded me the rubber fangs that came with the game for a few baseball cards I didn’t need. I didn’t even care who or how many people had put them in their mouth prior to my acquisition of them… when I shoved them in my mouth I became Barnabas! I couldn’t be bothered with mere germs! I had important playacting to do! My next effort was to find a suitable cloak to wear for my vampiric volitions. Luckily my mom had a black fabric skirt she didn’t need any more (I think what I ended up using was actually the crepe lining to the skirt if I remember right). It draped around my shoulders perfectly. And the shorter length replicated Barnabas’ famous Inverness cloak in my mind perfectly. During one of our regular shopping trips to K-Mart I found a perfect Barnabas ring…for all of $1! It was a lot of money to a kid my age, but well worth it! I wetted my hair and formed it into Barnabas bangs. I went to the local forest just outside our neighborhood and found a sturdy branch with the proper crook at the end for my cane. I bought some fake blood at Woolworth’s during the Halloween season. I was set to chase the girls around the neighborhood and inflict the wrath of “South Dakota Barnabas” upon their fainting souls! (I’ve long since stopped playacting as Barnabas, but I still chase girls…FYI) I was blessed that my parents had the wherewithal to capture my maniacal machinations on black and white Kodak film back then. As I was well into my early “cosplay” as Barnabas, I soon discovered the bubble gum cards. I couldn’t believe my luck when I acquired the Barnabas poster that came in one of the packs! I also enjoyed looking at the View Master reels and comic books endlessly! I fondly remember visiting my cousins in Idaho and bringing along all of my Barnabas collectibles, so we could set up a “fan club” in their tool shed. One of the happiest birthdays ever was when I got the Gold Key “Dark Shadows” digest! While reading it cover to cover I would pray to God every night to sink my chubby cheeks and thin out my face so I could look more like the creepy, gaunt Fridster! Yup, I was pretty much obsessed with Barnabas, Quentin, and that super creepy Count Petofi and his rubbery, floating hand. But years went on and the rubber fangs eventually got lost. The K-Mart ring broke off its band and had to be discarded (after many failed attempts at trying to Super Glue it), and my cloak somehow “disappeared.” But I never lost my love for the original gothic soap that made history weekday afternoons on ABC-TV. I vividly remember urging my mom to call the local ABC affiliate to ask why “Dark Shadows” wasn’t on that afternoon. With sadness, we learned of its cancellation. No more werewolf. No more Count Petofi. NO MORE BARNABAS! Years later my friend Dave told me about a festival he was going to that was “Dark Shadows” intensive. I had no idea such things even existed. He really got me intrigued when he said that females outnumbered males at the festivals 10 to 1! Eventually I started attending many of them and enjoyed meeting a lot of the show’s stars ... INCLUDING JONATHAN FRID! But the circle wasn’t quite complete until the great Jim Pierson cast me opposite Donna McKechnie and David Selby in an audio drama called “Dark Shadows: The Darkest Shadow.” Sitting next to David trading lines back and forth in our 3 pages of dialogue was a nerdboy’s dream come true! Sadly, we got everything perfect in the first take and we didn’t need to do any retakes…even though I would have gladly sat in that studio trading barbs with “Quentin” himself all day! When I got to say, “Quentin Collins, you’re a fool,” a chill literally ran up my spine. I couldn’t believe my luck! Through the kindness of my pal Don Frid, nephew of the late Jonathan Frid, I was able to acquire a collection of personal snapshots from Jonathan Frid’s estate after he passed away. But best of all, I was acquired Jonathan’s personal wolf’s head cane that he used at numerous appearances at “Dark Shadows” festivals. It would fit in perfectly with the lifesize Barnabas mannequin in my house! And Lara Parker and Kathryn Leigh Scott have been guests at my house in the past for screenings of “House of Dark Shadows” and “Night of Dark Shadows.” What a life! If my six year old self could see me now! For something called “DARK Shadows,” it sure brought a goodly amount of light into my life and imagination. Wally Wingert is an actor, singer, voice-over artist and radio personality. He was the announcer for "The Tonight Show with Jay Leno," provides the voice of The Riddler in the series "Arkamverse" series of BATMAN video games, Humpty Dumpty in 2016's "Alice Through the Looking Glass," and Jon Arbuckle in "The Garfield Show." You can find him online at www.wallyontheweb.com.